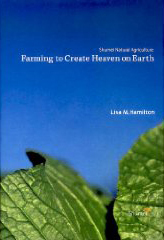 "Farming to Create Heaven on Earth" is an exploration of Natural Agriculture, the food and farming movement born in Japan and now practiced throughout the world. Each chapter tells the story of a farm or group of consumers who are practicing this philosophy-based approach to growing and eating food. Together, the stories introduce a new approach to considering our relationship with food, one that its members hope will do nothing less than achieve world peace. For more than ten years, writer and photographer Lisa M. Hamilton has been telling the stories of farmers in the United States and Asia. Her work has been published in National Geographic Traveler, Harper’s, The Nation, Orion and Gastronomica, and her latest book is "Deeply Rooted: Unconventional Farmers in the Age of Agribusiness" (Counterpoint, May 2009).